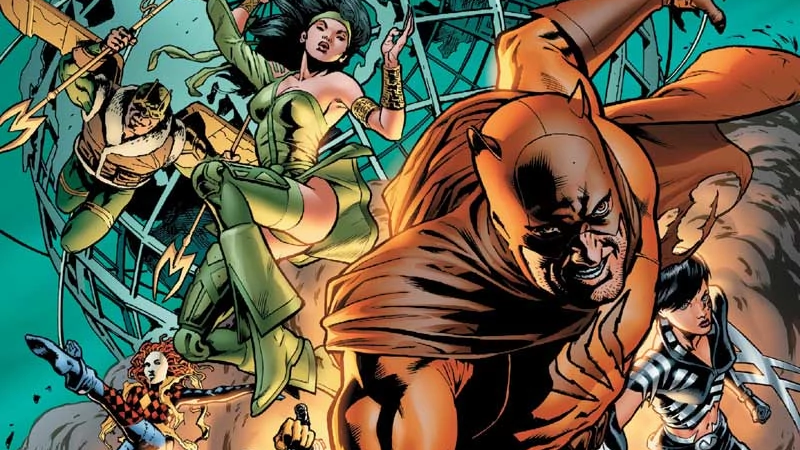 The more villainous Secret Six introduced in the 2000s, as seen in Villains United #4. Another DC TV show is apparently on the way—and it’s at CBS, best known in DC circles for, well...getting its last DC superhero show and then promptly dumping it a season later. Maybe this one is the long-awaited exciting pitch they’d been hoping for? Secret Six centers on six morally ambiguous strangers, each with their own unique specialties and secret pasts, who are brought together by an enigmatic figure who blackmails them into working as a team to expose the corruption of the corporate and political elite. Initially, the Six comprised of six (duh) secret agents, covert operatives sent on missions by a shadowy figure named Mockingbird, kept so secret that each member of the team suspects another of their allies as being the true Mockingbird. The original comic ended before Mockingbird’s identity could be revealed, before being revived in the ‘80s with a similar premise. But perhaps the best-known version of the team is a more villainous iteration created by Gail Simone and Dale Eaglesham for Villains United in 2005. The initial group included Catman, Deadshot, Cheshire, a Parademon, and two newly-created characters in the form of Rag Doll (a character recently revealed to be guest-starring on the CW’s The Flash this season) and Scandal Savage, the daughter of Vandal Savage. They were given an almost Suicide Squad-esque morally dubious set of missions by their own Mockingbird (who turned out to be Lex Luthor). Several other major villains, like Bane, Killer Frost, Jeannette, and Harley Quinn have rotated in and out of the team since. While the villain version of the team is the more familiar take on the Secret Six, given the easily-drawn Suicide Squad comparisons (and the fact Warner Bros. is marching ahead on continuing that movie franchise), it wouldn’t be too surprising to see this TV version lean more into the earlier versions of the team, as more of a covert-ops secret agent show with a dark edge rather than another villainous team-up. But whatever version of the Six ends up in this potential series (and if it goes beyond a pilot order), hopefully, CBS will stick with this one a bit longer than it did Supergirl. Don’t be too surprised to hear about a sudden jump to the CW in the future though!